Over the weekend, as I found myself far too ensconced in creating a tiger's face out of elastics on a plastic peg board, my young charge* having already grown tired of the activity and wandered away, I cracked a joke that I wasn't to be bothered as I was having a little art therapy time. To which my mother responded that I did art therapy everyday. She wasn't wrong. But she also wasn't right. So, I thought to myself, if I was to prescribe myself some art therapy, what would it look like? I think it would look like this! I know that colouring in mandalas has been adopted as a form of meditation in some circles and I thought that extending that idea into my washi tape world would be wonderful. Of course, if you find cutting small shapes frustrating rather than soothing, you should probably stick with the colouring. I started by tracing a circle (ahem - try a bowl or plate) onto a sheet of card stock and marking the centre point and reference points around the outer circle - at 3, 6, 9, 12 o'clock. 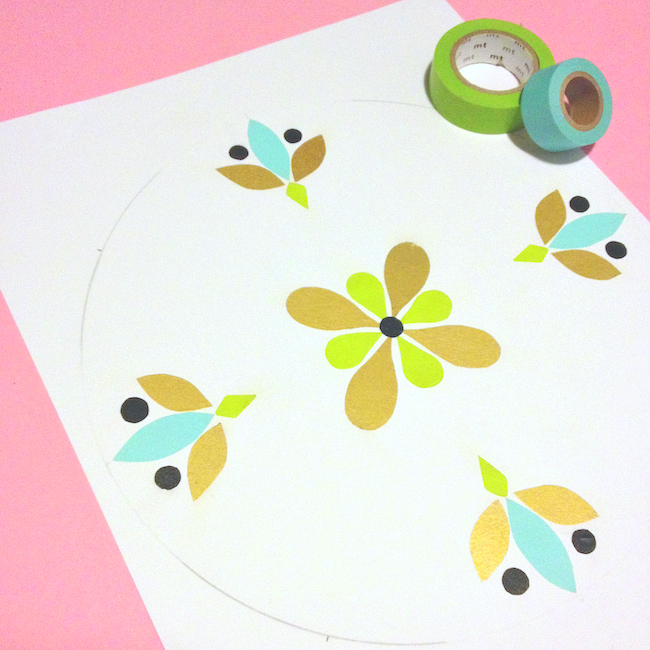 Then I cut small shapes - 4 or 8 of each - from washi tape covered parchment paper, peeled them off and applied, building the pattern as I went until it felt complete. I must admit, I'm pretty smitten with the final result. And 2 calm hours of washi tape collage at the end of a very Monday-ish Monday was a treat in and of itself. Anyway, the whole adventure got me thinking about the use of washi tape in art. If you have ever read the "origin story" of washi tape (you can find a brief version here), you'll note that washi tape was first produced for artists at the request of artists. I find that these tapes have been wholeheartedly embraced by crafters, snail mailers and scrapbookers, but we don't hear so much about washi tape in art. I'd love to see more washi tape art! 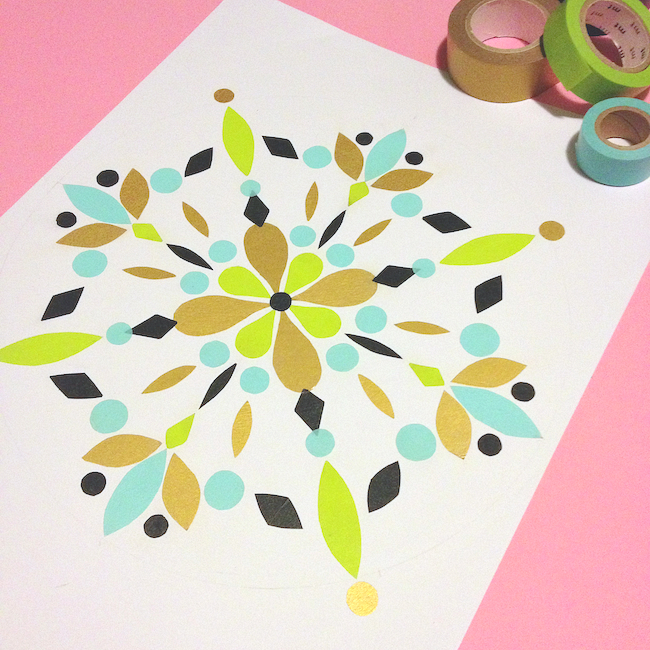 Do you use washi tape / decorative masking tapes to create art? I'd love to see or hear all about it! Excuse the grainy photos - I shot these on my phone last night. *We engaged in a little tag team babysitting on Sunday - 3 adults to 1 child. Those are good odds. I find your way very inspiring, thamks for sharing! So lovely. Thanks for sharing!